Let's change the meaning of YOLO from "you only live once" to "you only list once". 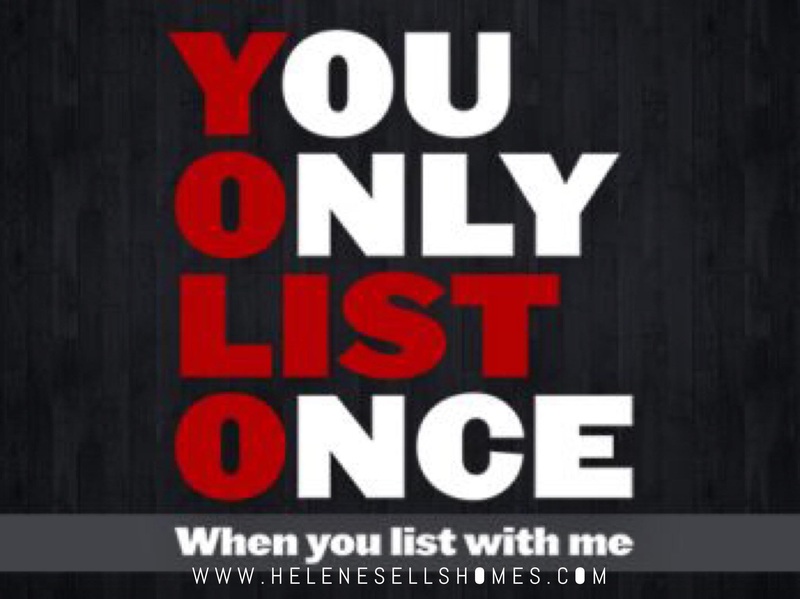 When you decide to list your house for sale, list it like it is the first, last, and only time you are going to. Because, if you list it more than once...it's going to hurt you. Selling your Maryland home begins in a hopeful manner. When you decide to list your home for sale, you probably don't expect it to not sell the first time you list it for sale. Quite the opposite... Most people think their house will sell quickly. And hopefully in a bidding war. You hire a real estate agent. Pictures are taken. The house is entered into the multiple listing service. Open houses are scheduled for the first weekend. Ads are run... ...and the house gets put on the Internet in more places than you can ever imagine, with just the click of a few buttons. How could it not sell? But a lot of times, homes don't sell quickly. Or at all... If a house doesn't sell quickly, many homeowners start to get discouraged, even after just a few weeks. It gets worse if it starts stretching into months and months. Many homeowners start to wonder if their real estate agent isn't getting the job done. And they start considering either "withdrawing" their listing, or letting their contract with the real estate agent "expire", and plan on hiring a different agent. Some homeowners have total faith in their real estate agent. They want to stick with the agent they have hired. But they think it would be good to withdraw their listing, and pop it back on the market so it looks like a new listing, hoping to get buyers' attention. This is a mistake. Back in the day, this little trick could work. But, it isn't fooling anyone anymore, and it can have a less than desirable effect. If a house has been listed before. How many times it has been listed. How long it's been on the market. And even more information...like if there's any pending foreclosure, for instance. Basically put, more information is available than you would ever want made available. And you have no control over it. Nor does your real estate agent. All of this information is "scraped" and aggregated by real estate websites, like Zillow and Trulia. Back in the day, it was no big deal to withdraw your listing, or let it expire, and relist it. Few people would be aware of it, unless a real estate agent dug up the information and chose to share it with their client. Now, a buyer would almost have to deliberately avoid seeing this information. Whether it's right, wrong, or somewhere in between, the number of times your home has been listed, and the length of time your house has been on the market, affect how buyers perceive your home and its value. This stinks, because you can have absolutely valid reasons why your home isn't selling quickly... Perhaps it's a supply and demand issue. (Too many houses available and too few buyers buying houses.) Or maybe you have a high-end home, and there just aren't many sales in the price range, so it takes quite some time to sell. Those sorts of reasons are valid. There's nothing you can do to affect that. And it's awful (for sellers at least), but the Internet and available information can cause buyers to sense that the house isn't selling because "something is wrong". Or buyers may feel like, "since the house has been on the market for so long, the owner has to be negotiable or desperate." There's plenty of other legitimate reasons a house may linger longer on the market... But way too often, the reason houses linger on the market is because homeowners list their home for way too much money. And, quite often, don't reduce their price to be in line with the market and actual value. That you can, and should control... Otherwise, you're causing buyers to dismiss, overlook, or undervalue your home...because the Internet. Make sure you hire a real estate agent who gives you an honest assessment of your home's value. Do not hire an agent that simply says your home is worth the amount you want to hear. Or one who agrees to list your house for a higher price than they recommend, just to appease you and get your listing. Don't withdraw your listing, or let it expire, if at all possible. If your home is not selling, assess whether the price is reasonable for the market. If it's, be patient. Keep it on the market. Stay the course. If you have hired a good real estate agent, and he or she disagrees with this, listen to them. Real estate is "local". Your agent will know what may help or hurt you in your area, more than a general article. But, if you and your agent are discussing withdrawing or relisting your property, maybe you should bring up what you have read here. Your agent may never have even thought about this angle. At least it can lead to an in depth conversation about the pros and cons of withdrawing or relisting your home, before just doing it because it seems like a good thing to do. Again, there are valid reasons a home can linger on the market. Things you and your agent can't control. It's not the end of the world. It doesn't spell doom for your sale. A good agent isn't going to let a buyer get your house for a steal, just because of some information the buyer has seen on the Internet. However, what they find and see on the Internet will certainly fill their mind with thoughts. So, try not to give them anything to think about, other than making a full price offer as quickly as possible.